Whether made spicy or not, people like this a lot. This along with the equally simple Chicken And Spinach Soup will be two of the best recipes in your collection. Both are variations of recipes in the now out of print, The All*American Chinese Cookbook. If you can get your hands on a used copy (try Amazon) do so. Mix sauce ingredients in a bowl or large cup. Mix marinade ingredients in a bowl. Trim membranes, veins, fat, and other grisly bits from the chicken breasts. Cut chicken breasts into 1/2 inch slices the long way. Then cut each slice into 1/2 inch pieces. Add to marinade and mix well. The marinade will only sit for about 20 minutes while you prepare the other ingredients. If you’d like to marinate longer, cover and refrigerate. Have all the ingredients ready to go before you start cooking. This is going to cook really fast. Heat the oil in a wok, non-stick frying pan or wok-like-hybrid (that’s what I have) over low heat. Add the garlic, and optional crushed red peppers to the oil. Let the garlic and peppers lightly sizzle for a minute or two to flavor the oil. Don’t burn the garlic. Raise the heat to medium-high. Add the chicken. Stir-fry for about 3 minutes after the oil and pan heats up. 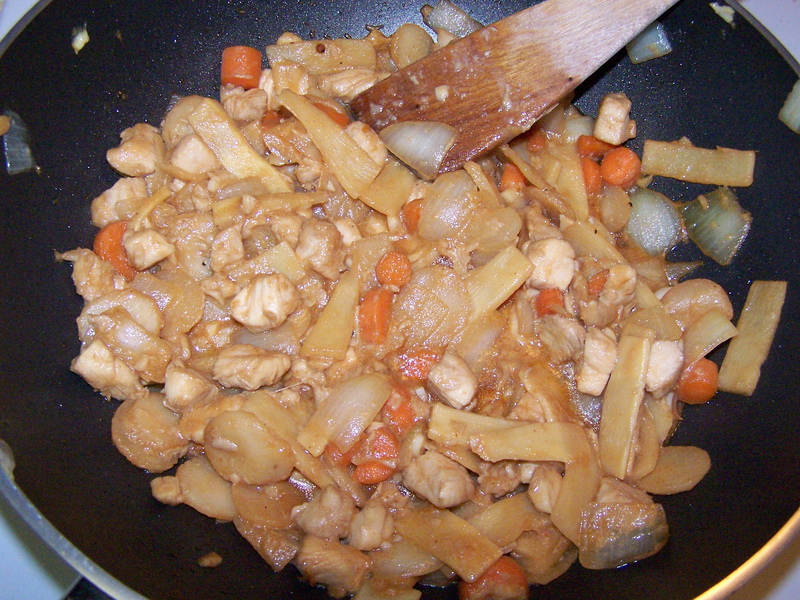 Add the onions, water chestnuts and carrots. Stir-fry for about 3 minutes to cook the vegetables but not cook them into mush. Add the sauce. Stir-fry for another 2 minutes. Make sure the chicken is cooked through. Remove from the heat. If you use a frying pan, you may want to use a little more oil to cover more of the pan. Have some green onions around? If you have enough, slice them up and use them in place of the onions. If you have less, use them in addition to the onions. Use the whole green onion, green part included. Add them just before adding the sauce, as they won’t need long to cook. If you’re really good with a wok and cook on high heat, shorten the cooking times accordingly. Of course, if you’re really good, you’ve figured this out already. The sauce goes further than it looks once it starts to cook. This refrigerates well. In fact it may taste better the next day. In any case you’ll find it difficult to stop yourself from plucking out little pieces of this and that and popping them in your mouth. 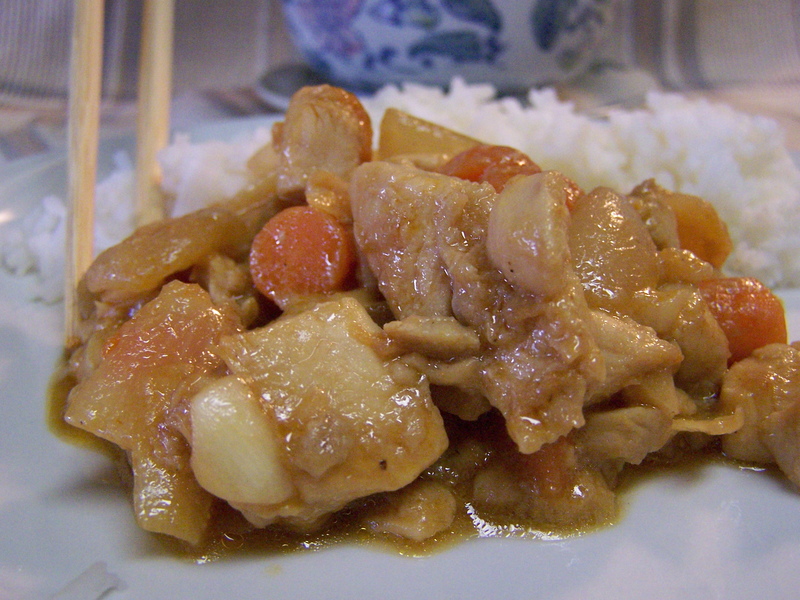 This entry was posted on 04/16/2011 at 10:00 and is filed under Recipes, Recipes, food, cooking and related items. You can follow any responses to this entry through the RSS 2.0 feed. You can leave a response, or trackback from your own site.